There is a limit to everything. 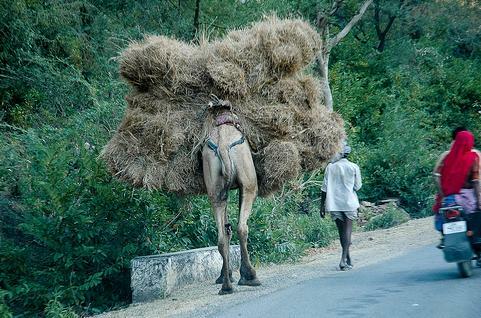 We can load the camel with lots of straw, but finally it will be too much and the camel’s back will break. And it is only a single straw that breaks its back – the last straw. This can be applied to many things in life. People often say “That’s the last straw!” when they will not accept any more of something. There are a Spanish phrase and a Chinese phrase which have a similar meaning to the subject proverb and they are “La gota que colmó el vaso” and 忍无可忍 respectively. You broke a lot of rules and I tried to put up with you. However, stealing money is the straw that broke the camel’s back. You are fired! Rompiste muchas reglas y trato de aguantarte. Pero haberte robado el dinero es la gota que colmó el vaso. íEstás despedido! You have been rude to me all day. I’ve had it. That’s the last straw. Has sido muy maleducado conmigo todo el día. ¡Me harté! !Esto es el colmo!